Has it been running continously since then?? So what dial you got? Let us see its face . By the way I really like that black movement spacer! 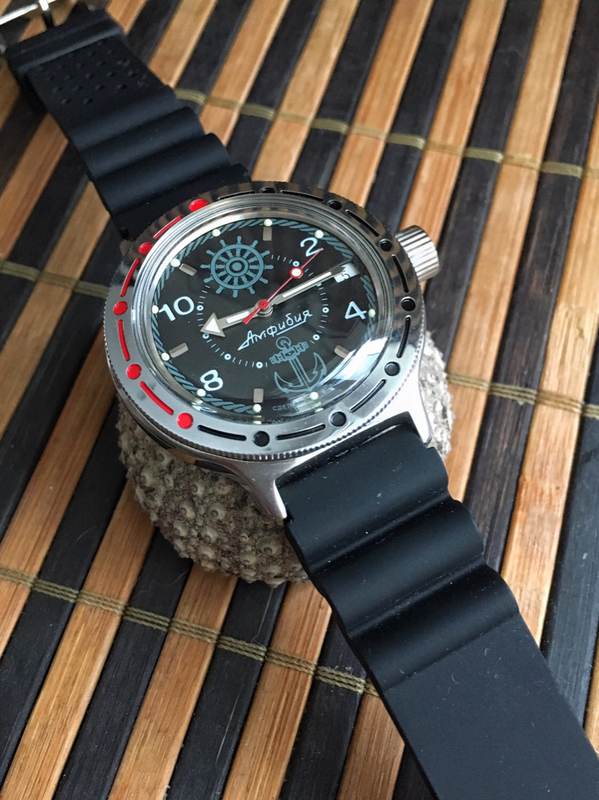 One of my newest Amphibias has a purple one... Vostok has always produced natural nylon color movement spacers... I hope they continue putting colored ones from now on, are a nice touch. 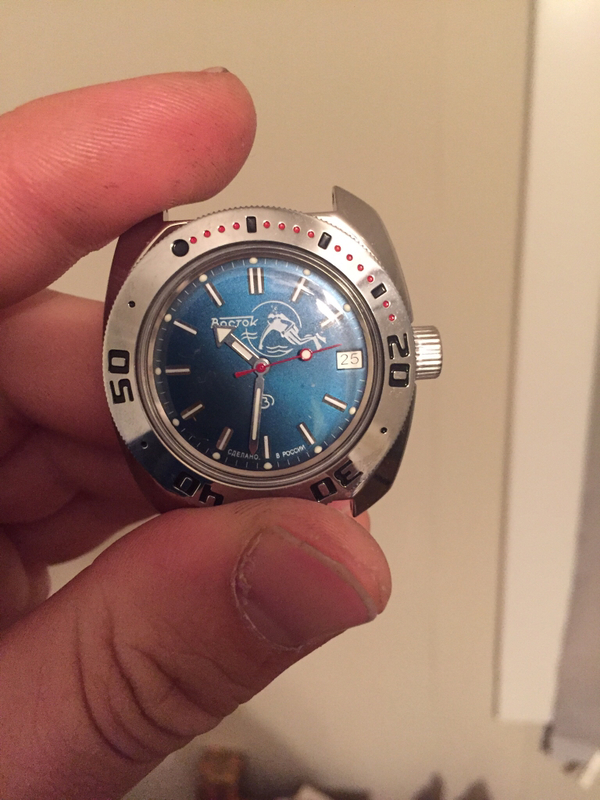 I wanted to get the same one that Bill Murray wears in "The Life Aquatic", and this dial was the one the Internet identified. It's still running as of today, although quite fast. I've been wearing it all my waking hours and really enjoying it. Neruda, Dave_Mc and Oygen like this. 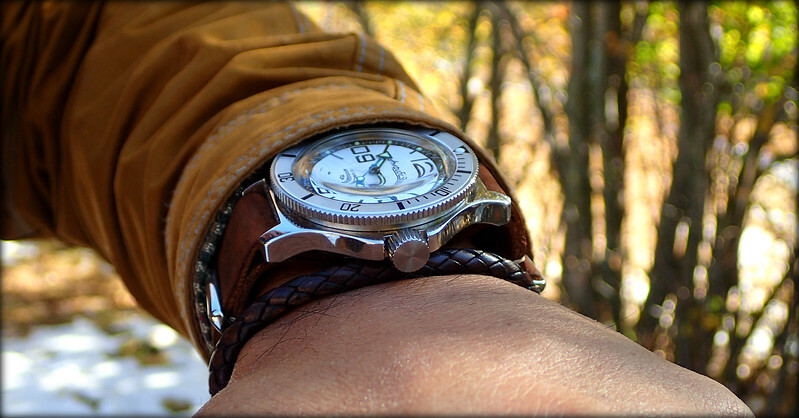 Timeslider - you can regulate your watch, many people can get within 5 seconds per day. Looks like the arrow pointing to the +/- signs on the balance bridge is a bit too far on the plus side. This is moved by the lever on the left. You can do this by trial and error, but a watchmaker with a time graph could do this much more easily and precisely. And congratulations on the Vostok! 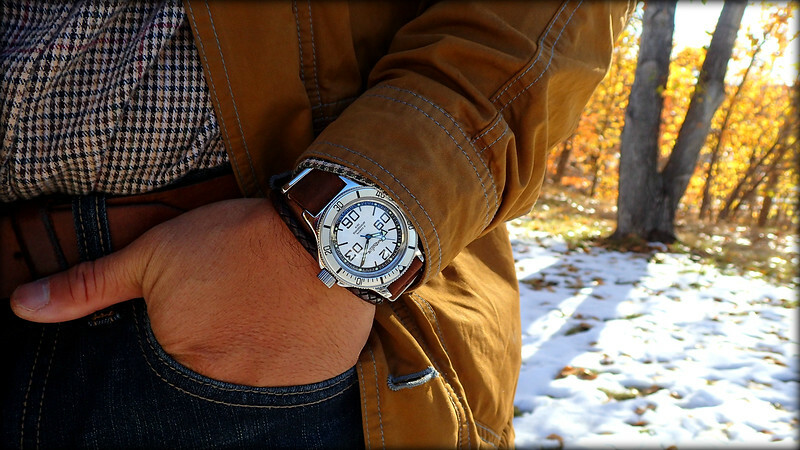 That is an incredible looking watch. Wish they made more. "A life not lived, is a life lost"
My 710. Has the aqua green/blue dial, which i wasnt a huge fan of, but it is growing on me. I have a black sharks tooth bezel, grey bezel insert, exhibition case-back, steel movement holder and orange trident second hand on the way. Going to try and do a brushed finish on the case and ill end up ordering a shark mesh ss strap for it. Going to be my first amphibia and my first mod. Anyone know how difficult it is to swap the second hand out? My grandfather has worked on watches for a long time so ill probably ask him for some help. Managed to fettle all mine in this way to a few seconds a day..
Two days later and it’s only 5 seconds fast. Does Meranom regulate the watches, or am I just lucky? I put it on this parnis rubber strap,I had. I thinks it’s going to remain like this now, it’s giving me a Hublot Big Bang kind of vibe. larand, isti, tokareva and 2 others like this. Second hand is usually very easy. Order a cheap hand puller to yank the old one off and then press the new one on. Keep in mind the reverse side of the seconds pinion is held by a leaf spring and obscured by the automatic mechanism. This spring needs to be uncovered and supported should the second hand prove to be trouble to secure on the pinion. itsmemuffins and tokareva like this. Hmmmm. Well my Neptune that arrived from meranom yesterday, been wearing it all day today and although I didn't set it precisely to the exact second it still looks bang on time too. tokareva, itsmemuffins, elsoldemayo and 3 others like this. All times are GMT +2. The time now is 01:34.